The lunch at Bouley in Tribeca may be one of the best deals (five courses for $55) in New York City, especially since it happens to be in one of the most beautifully decorated and ornate restaurants I’ve seen. 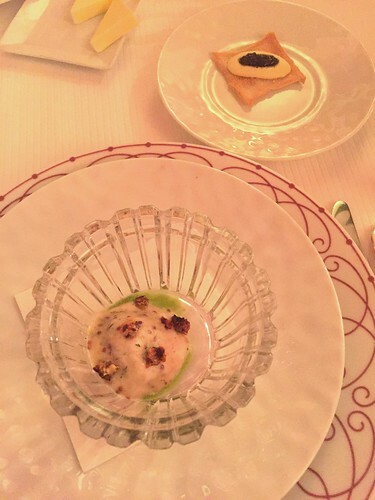 To start – some complimentary amuse bouches that I honestly don’t remember too much about (except that the cracker looking bite had caviar and some kind of black truffle cream). For the first course, I chose the “blini” of Scottish smoked salmon with roe and white truffle honey. The dish was topped with some sort of apple meringue that was a bit too sweet for my taste, especially since the truffle honey was already sweet, but the roe provided some necessary saltiness. 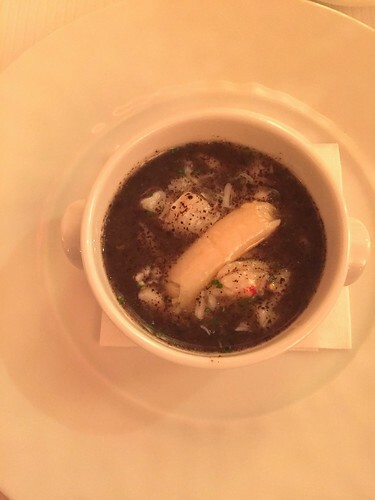 Next, one of Bouley’s most famous dishes, the porcini flan with golden princess crab and black truffle dashi. This was amazing – it came to the table with a cover and when removed, all one could smell was black truffle and brininess from the crab. Really warm and comforting, like a Japanese chawanmushi or egg custard, the portion initially seemed kind of small but was so packed with flavor and richness that it turned out to be just the right amount. 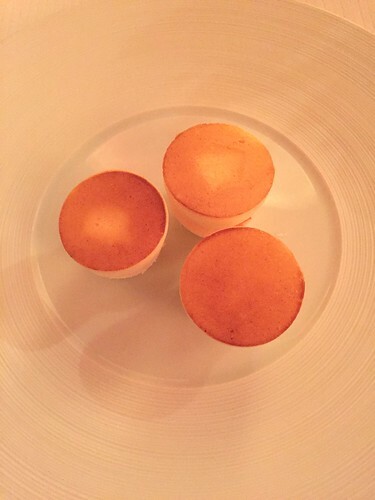 I would go back to Bouley just to have this dish again. Also, what I forgot to take a picture of was the amazing bread cart that they wheel to each table after this course. I think there were about twelve different varieties (the usual sourdough all the way to a pistachio and apricot version) and you could potentially try every one of them, but we had to keep in mind that we had more courses coming. 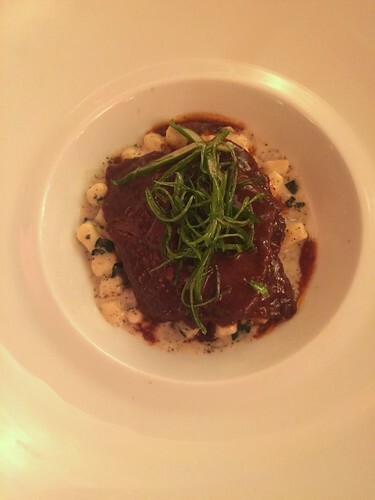 The main dish, a slow braised Kobe-style beef cheeks with blue kale gnocchi, also hit the spot. I don’t have beef cheeks very often but always love how tender and unctuous they can be when done well and the sauce that came with was super savory and just this side of being over-seasoned. Also really enjoyed the perfectly cooked gnocchi (because who doesn’t love some butter soaked starch with their beef?). 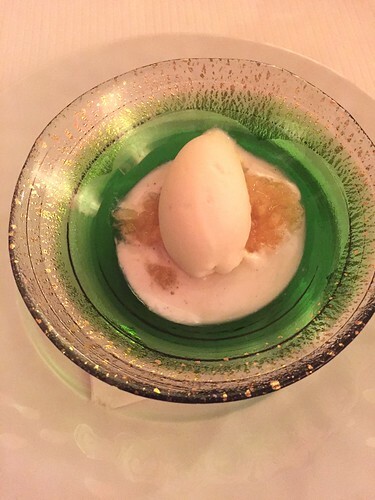 For a palate cleanser after our savory dishes, a chilled coconut soup with pineapple granite, 10 exotic fruit sorbet, passion fruit and coconut ice cream. Really refreshing with a good balance of sweet and tart – this almost punched you in the face with its coconutiness. 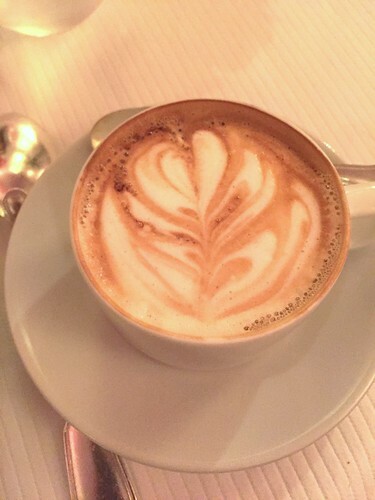 Around this time, we were struggling to stay awake, so a cappuccino was in order. 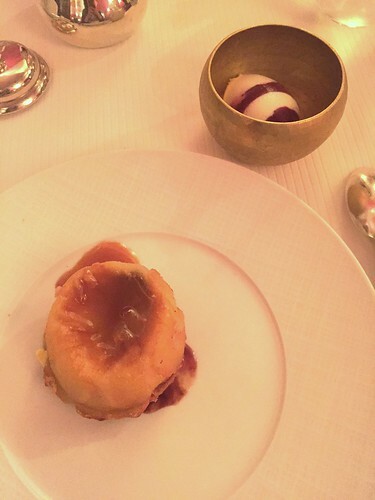 My dessert was the hot caramelized Anjou pear with Valrhona chocolate, biscuit Breton, hot toffee sauce and huckleberry and Tahitian vanilla ice cream, which was a bit too sweet for me and since I was so full, I was only able to take a couple bites. 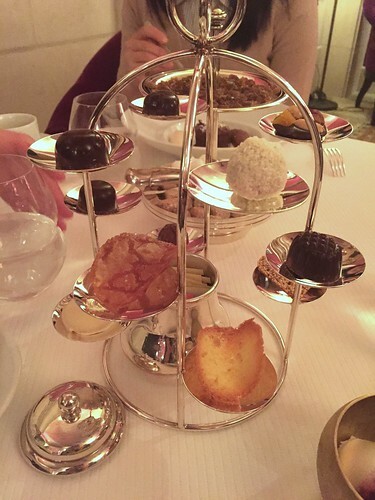 However, when the tower of mignardises and petits fours came out, I had no problem popping a few chocolate bonbons in my mouth. 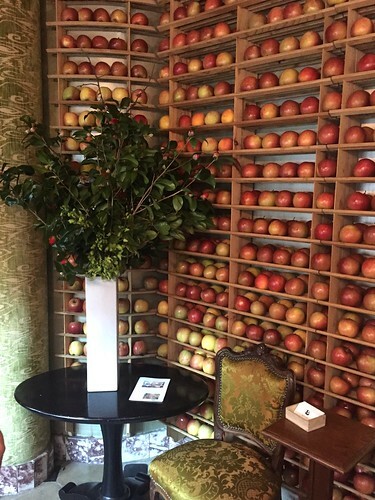 You are currently reading Bouley lunch at Notes on Food.